Bald, dead patches on a turf lawn appear from time to time, even in the best-tended lawn. Often, the reasons will be obvious, but sometimes it can be something of a mystery as to just what is going on. If you have dead, bald spots in your lawn, first, you should determine the cause and use whatever measures to remove the cause of the problem. Then, repair the bare patch, which is a fairly simple process with reseeding or a sod patch. Going forward, work to prevent a future recurrence. 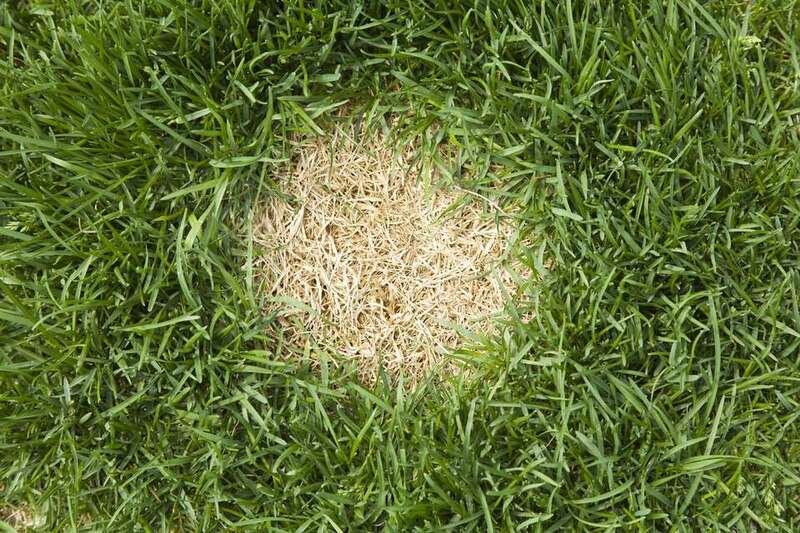 Take a look at some of the most common reasons why dead spots might occur on your lawn. Dogs, cats, and wild animals urinating on your lawn will usually leave a tell-tale brown, straw-like patch due to the high concentration of urea that burns the grass. But just around this dead spot, there may a ring of very dark green, unusually healthy grass—the result of a higher-than-normal nitrogen level. If you catch an animal urinating, then you may be able to prevent the burn by watering the spot thoroughly immediately afterward. Grubs are the larvae of various hard-shelled beetles, such as the Japanese beetle or June bug. A lawn can tolerate some degree of grub infestation, but if the concentration is high, dead patches will appear in your lawn. A strong sign that you are dealing with grubs is if the dead patch lifts up away from the ground easily when you tug on the grass. Grubs eat the roots of grass and leave nothing to hold the grass in place. Addressing this problem involves reseeding or resodding and preferably after you have dealt with the grub infestation. Lawn diseases such as snow mold can kill patches of lawn. If you see fine white webbing covering the lawn and gradually killing the grass, then that is a potential sign of a fungal disease. Fungal diseases are common and usually due to temporary environmental conditions. Good lawn care practices reduce the likelihood of recurrence, and there is usually no need for aggressive measures. Spilled pesticides or broad-spectrum herbicides such as glyphosate (Roundup) will often cause dead spots in the lawn. Even if you have an appropriate weed killer, its concentration may be just a little too high for your lawn and can kill turf grasses. Chemical spills will often create an irregularly shaped dead patch that matches the shape of the spill. Water the spot thoroughly if you accidentally spill. Take extra care when you have strong chemicals near your grass, and be very careful about preventing a spill. It's best to prevent a problem than to try to fix it. In northern climates where salt is applied as an anti-icing measure, it is common to see dead spots appear along streets and sidewalks as grasses begin growing in the spring. Sometimes these areas will heal themselves with plenty of water in the spring, but you may be left having to reseed or put down more sod. Minimizing your own application of salt on the sidewalks will help reduce future problems, but along roadways, your only option might be to look for non-grass groundcovers to plant. During hot weather, rocks or stone just beneath the lawn may heat up enough to burn the grass from the bottom up. If you notice that spots occur in the same place whenever it gets hot, consider digging into the lawn to see if there are hidden sources of heat like big rocks or some debris. Sprinklers that do not overlap or that miss an area completely may cause small areas of turf to brown-out and go dormant. When watering, observe the sprinkler patterns for a while and make sure that your lawn coverage is uniform.